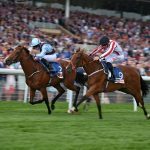 The 2,000 Guineas arrives so early in the season – even earlier than usual on April 30 this year – that juvenile form is frequently the factor which determines who goes off favourite. Punters often have to rely on evidence obtained six months or more in the past, which has to be of dubious value, so it should be no surprise that the record of those who have dominated the market for the first colts’ Classic through the winter is somewhat mixed. As I write, the colt who impressed everyone except the compilers of the World Thoroughbred Rankings as easily the best two-year-old of his generation stands at just a shade of odds against for the Guineas. He even features as short as 3-1 for the Derby, in spite of the fact that his experienced trainer is on record as doubting the colt’s capacity for Epsom’s mile and a half. So is Frankel the superstar many supposed him to be when he came through his first season unbeaten, climaxing his campaign with victory in a Dewhurst Stakes not run to suit him? We are promised a further clue before the Guineas as Henry Cecil plans to bring him back in Newbury’s Greenham Stakes, but what can we expect that outing to tell us? The colt, not fully wound up, will face a small field of apparently inferior wannabes and he might well win as he likes, becoming an odds-on choice for the Classic, without providing convincing evidence that he will be up to defeating more and stronger rivals a fortnight later. Without wishing to alarm anyone with an ante-post voucher on Frankel at a fancy price, my mind goes back to 1963, when the Guineas market was headed by Crocket, a King Of The Tudors colt who had won all five of his races as a juvenile, dominating the division. He reappeared in the Craven Stakes and was all out to win by a head, but his connections were reassuringly satisfied by the performance and an impressive final gallop ensured he started favourite at 5-2 in a field of 21 on the big day. He finished 21st. There was an almost exact parallel in 1978. Try My Best had been unbeaten at two, his comfortable win in the Dewhurst guaranteeing he was named champion of his crop. Such was his reputation that Timeform declared him “a ready-made winner of the 2,000 Guineas”, with the caveat “provided the race is run on a sound surface.” He came back with an emphatic two-length triumph in the Vauxhall Trial Stakes at Phoenix Park and was at even money when the stalls opened for the Classic. But there had been rain on the day and the soft ground did not suit the son of Northern Dancer. After two furlongs he was stone last, he never promised to improve his position and at the finish he was tailed off, 19th of the 19 runners. Could there ever have been a worse display by a Guineas favourite than those by Crocket and Try My Best? Well, yes, actually, and I remember the occasion well. It was 1969 and most people found it hard to look beyond Ribofilio. He had been the champion juvenile, impressive in the Champagne Stakes and dominant in the Dewhurst. And he had come back with a victory in the Ascot 2,000 Guineas Trial, albeit in slow time against negligible rivals. There were no more than a dozen in opposition on the big day and at 15-8 Ribofilio was confidently expected to blow them away. Oh dear! 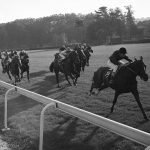 The supposed leader of his generation was in trouble and under pressure after a furlong, tailed off after three, and at halfway Lester Piggott abandoned pursuit, pulling him up. Effectively, the race was run without the favourite and Right Tack cruised to a victory that was undervalued until he went on to confirm his class as the first to add the Curragh Guineas to success on the Rowley Mile. What happened to Ribofilio? We never found out and although the dope test was negative, suspicion remained there were some who knew that the favourite was not going to win. Hours afterwards, in a Newmarket hostelry, I partook of a glass or three with a prominent bookmaker who admitted to having made a fortune by laying Ribofilio. Why would he have been so keen to lay the presumed certainty? “I just didn’t fancy him” was the not all too convincing retort. Poor Ribofilio went on to compile the unenviable and unprecedented record of being the beaten favourite in four Classics – at 7-2 in the Derby, 2-1 in the Irish Derby and 11-10 in the St Leger. Of course, there have also been those who ruled as firm favourites for the Guineas over the winter but who did not even make it to the post. Could there have been any reason to doubt the credentials of Tromos in 1979? Tremendously impressive in the Dewhurst Stakes, he ranked 5lb clear of the next-best juvenile of his year and Timeform declared: “We think Tromos will take the world of beating as a three-year-old and can’t see anything to trouble him in the Guineas except the ground, should it be soft.” The going was good but Tromos was not there; he had surrendered tamely to Lyphard’s Wish in the Craven Stakes, then contracted a virus which meant he never raced again. Four years later there was Danzatore, a Northern Dancer colt unbeaten at two and who had returned victorious at Phoenix Park. In mid-April he ruled as 7-4 favourite in ante-post lists, but a week later, after a disappointing gallop, was taken out of the Classic and the previously unconsidered Lomond was sent to deputise successfully for the Ballydoyle stable. Apalachee couldn’t be beaten, could he? The 2,000 Guineas always represented a prime target for Vincent O’Brien and if Try My Best has to be cited as his most calamitous loser, there were other disappointing favourites, like Thatch, only fourth at 5-2 in 1973, The Minstrel, third at 6-5 in 1977, and more remarkably, Apalachee, sent off at 4-9 in 1974. Timeform had given Apalachee the outlandish rating of 137 as a two-year-old after a couple of wide-margin wins in Ireland and an emphatic victory over Grand Criterium hero Mississippian in the Observer Gold Cup. The accompanying comment could hardly have been more enthusiastic: “Quite frankly we can see nothing to stop him winning both the 2,000 Guineas and the Derby. We have not seen a horse as promising as this for years.” The shortest-priced Guineas favourite in four decades was soundly beaten and never seen on a racecourse again. After that debacle, it was many years before Timeform gave another two-year-old such extravagant praise, but in 1994 the sages of Halifax did it again. Celtic Swing had won the Hyperion Stakes at Ascot by eight lengths and the Racing Post Trophy by 12, which prompted a rating of 138 and the comment that the 2,000 Guineas and Derby were a foregone conclusion. Celtic Swing did prove to be an excellent three-year-old, but at 4-5 he failed by a head against Pennekamp at Newmarket and the Derby he won was at Chantilly, not Epsom. All these results indicate the 2,000 Guineas is regularly a race which underlines the pitfalls of ante-post betting, and it is easy to appreciate why that should be. In the months that pass between the top two-year-old races and the first colts’ Classic there may be any number of developments to affect issues that seemed clearcut. Those looking for a lucrative pay-day over Frankel on the last day of this month must hope that this is one of the years that confirm impressions formed in the previous season. There is reassurance to be gained by remembering such as Sir Ivor, Nijinsky, Wollow, El Gran Senor, Zafonic and George Washington, who all fulfilled their juvenile promise on Guineas day.